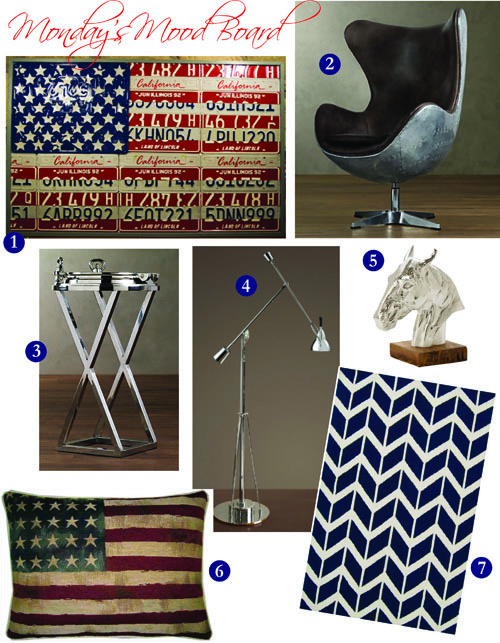 Monday's Mood Board - President's Day! This Monday’s Mood Board is in honor of “President's Day” and depending on which State you live in you may be celebrating Washington, Lincoln and other notable Presidents…but for me it’s also a Celebration of this Country. We’ve been pretty beat up lately but I still believe in the USA! This great Spitfire Chair, 19th Century Porthole Side Table and Counterpoise Task Floor Lamp are from Restoration Hardware. The Flag Pillow and Wall Art (made of USA License Plates) are from two very talented ETSY artists. The beautiful Horse Sculpture is from one of my favorite shops on the web, ShopTen 25 and the Fallon Zig Zag Federal Blue Rug is from another fantastic on-line shop, Zinc Door! Raise your flag, send good thoughts out for our Country, and enjoy your holiday!